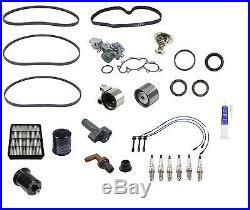 Genuine/OEM Timing Belt & Water Pump Tune UP KIT Toyota 4Runner Tacoma 3.4L V6. Timing Belt & Water Pump Tune UP KIT. One - 13568 69095 - Genuine Toyota Engine Timing Belt. One - One - 13503 62040 - NSK Engine Timing Belt Roller. One - 90311 40013 - KP Engine Crankshaft Seal 40 X 55 X 6 Front. Two - 90311 38051 - Stone Engine Camshaft Seals Front. One - 16100 69398 - Aisin Engine Water Pump w/ Fitting for oil cooler. One - 13540 62021 - Genuine Toyota Engine Timing Belt Tensioner Auto Adjuster for Tensioner Roller For tensioner roller. One - 90916 03075 82 - Kuzeh Engine Coolant Thermostat 82c OE / OES supplier. One - 16325 62010 - Stone Engine Coolant Thermostat Seal O-Ring. One - 4 PK 1050B - Bando Serpentine Belt Alternator. One - 4 PK 1065B - Bando Serpentine Belt POwer Steering. One - 4 PK 870B - Bando Serpentine Belt. One - 90915 YZZD1 OE - Genuine Toyota Engine Oil Filter Spin On Specific Application. One - 127 51 013 - Original Performance Fuel Filter. Six - K16TR11 - Denso Regular Resistor Spark Plugs U Groove Electrode; Copper; Resistor. One - TE 66 - NGK Spark Plug Wire Set High Performance 3 Wire Set works in conjunction with 3 direct ignition coils Premium. V6; 3.4L; From 9/97. V6; 3.4L; 5VZFE Eng. The item "Genuine/OEM Timing Belt & Water Pump Tune UP KIT Toyota 4Runner Tacoma 3.4L V6" is in sale since Monday, June 22, 2015. This item is in the category "eBay Motors\Parts & Accessories\Car & Truck Parts\Engines & Components\Timing Components". The seller is "partscontainer" and is located in Nashville, Tennessee. This item can be shipped to United States, to Canada, to United Kingdom, to Australia, to Mexico, to Germany, to Japan, DK, RO, SK, BG, CZ, FI, HU, LV, LT, MT, EE, GR, PT, CY, SI, to China, SE, KR, to Taiwan, ZA, TH, to Belgium, to France, to Hong Kong, to Ireland, to Netherlands, PL, to Spain, to Italy, to Austria, RU, IL, to New Zealand, PH, SG, to Switzerland, NO, SA, UA, AE, QA, KW, BH, HR, MY, BR, CL, CO, CR, PA, TT, GT, HN, JM.